Hi! I'm Myra Jenkins. I live next door to Daphne Martin. You all probably know Daphne, she just moved back to Brea Ridge--Virginia, that is--and started running a cake decorating business from her house. She's a nice girl, and I wish her well, but she picked a doozy of a first client. Yodel Watson is--well, was--the meanest gossip in town. Poor Daphne took her first cake over to Yodel's house. The cake was a beautiful white cake with raspberry filling. REJECTED! Yodel said it was too fancy and that people wouldn't believe she'd made it herself. As if. The second cake was chocolate with a hazelnut mocha frosting. Yummy! And what did Yodel think of that cake? You guessed it--REJECTED! Too plain this time. Well, I was keeping my fingers crossed this morning when Daphne took the third cake over. It was a spice cake with cream cheese frosting and just the right amount of fanciness. But, God love her, here she came back with the box. I hurried over to provide a shoulder for the poor dear. And while I was at it, I ran my finger through the cream cheese frosting and it was out-of-this-world good! I asked Daphne what the old bat found wrong with this one, and guess what? Daphne said Yodel was DEAD! The first thing that came to my mind was that Yodel had wrecked that old car of hers. She pinched pennies so hard it made Lincoln scream, so you can imagine how junky her car was--bald tires, back fender looking like it could fall off in the road any second.... But it wasn't that car that did her in. She was just lying on the couch in her den. Dead. I asked Daphne if Yodel was naked. You know, on TV they're always finding dead people naked. Fortunately, that was not the case with Yodel. Daphne said she was wearing pajamas and a robe. Anyway, the police think Yodel might've been poisoned. And folks are whispering around that Daphne's cake might be the murder weapon. I sure hope not. I done told you I ate a fingerful of that icing! 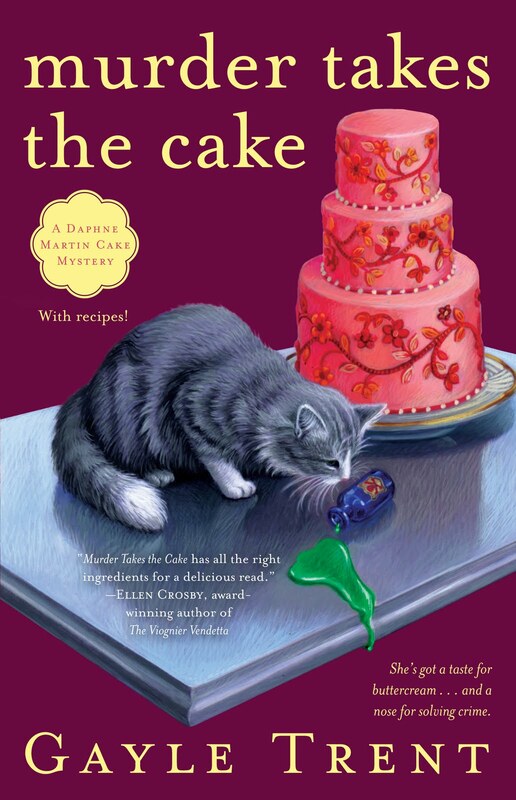 Gayle Trent writes the Daphne Martin Mystery Series for Gallery. Murder Takes the Cake will be released on March 29, 2011. Please join Gayle on Facebook for the virtual release party where prizes will be given away throughout the day! Thanks, Myra. Now I'm sitting here debating with myself. Carrot cake with cream cheese icing. No, devil's food with fudge icing. No, wait, orange cake with orange icing! And then there's gingerbread with no icing, but lots of chunks of candied ginger baked into it. Yum. Then it's back to carrot cake, the one a 14-year-old made with a whole can of pineapple in it. In case you wondered, the whole *can* wasn't baked into the cake, only the contents of the can, and the pineapple was crushed. Ooooh! Ooooh! That reminds me. Pineapple upside down cake. Just want to state that I have an alibi for Yodel's murder even though I am not in your mysteries. I did feel like killing her. My favorite cake is my mother's chocolate cake, now being made by the 4th generation! There's nobody I want to kill with a cake...at the moment. Thanks for the suggestion though, Myra! Chocolate mousse cake with dark chocolate icing comes to mind when I think of a favorite cake. Did I mention, with chocolate sprinkles? Definitely picking up cake and a new book while out today. LOL!! I don't think I could kill anyone with cake. I'd never be able to eat cake again. I'm thinking Pineapple-Upside down cake. Or maybe just a chocolate cake with chocolate icing. Decisions, decisions, decisions!! It would be wrong to waste a cake by tainting it with poison--the police ought to know that. My favorite? Too hard to choose. Italian wedding cake is up there, though! Carrot cake, with cream cheese icing almost as thick as the cake... yum! But cake as a murder weapon? Noooo! That would be a waste of cake. The white cake with raspberry filling sounds delicious. Do you know where I can get a recipe? Or better yet, where I can find someone to bake it for me? Favorite cake and haven't made in years: Blum's coffee crunch cake. Blum's used to be a San Francisco bakery. Fabulous! Now, I'm hungry. I'm looking forward to reading this book. My favorite cake is plain yellow or white with chocolate frosting and I would never waste good food by killing someone with it. Chocolate cake with chocolate frosting, can't get any better than that for me. And I have to agree that using a cake to murder someone is a waste.